UAB Baltic Fresh Fruit was found in 2008. 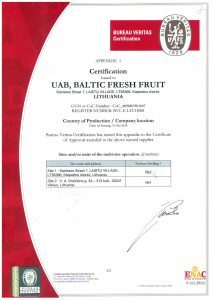 As of that moment the company has been successfully developing its business throughout Lithuania. The company’s main activity is fresh fruits and vegetables import from all over the world. The company’s main objective is to ensure the maximum quality level of services to meet the customers’ needs. Our value – is our team. The most valuable features of the company are ambition to help and professionalism. We desire to create value for our clients, our team and our country. We strive to become one of leading companies with big name and great reputation and not only in Europe. Distribution: we supply fruits and vegetables to supermarkets and wholesale customers in the Baltic countries and regularly introduce new varieties of products. Exports: to the Russian Federation, Belarus, Kazakhstan, Kyrgyzstan, Ukraine, and Poland. Opening of our own “Baltic Fresh Fruit” 4000 m2 warehouse in the summer of 2013. Opening of Vilnius branch and warehouse. Warehouse expansion in Vilnius up to – 2000 m2. In the warehouse built banana ripening room. • Construction of our own warehouse in Vilnius.